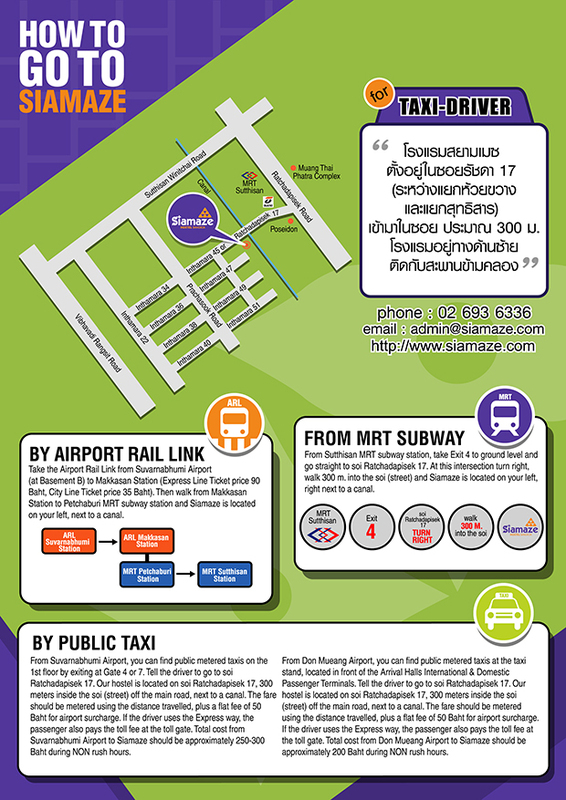 Take the Airport Rail Link from Suvarnabhumi Airport (at Basement floor) to Makkasan Station (City Line Ticket price 35 Baht). Please note that there is no ARL from Donmueang Airport at the moment. Then walk from Makkasan Station to Petchaburi MRT underground train station and take the MRT underground train to Sutthisan station (Ticket price 22 Baht). Go straight the same direction as the stairway to Soi Ratchadapisek 17. 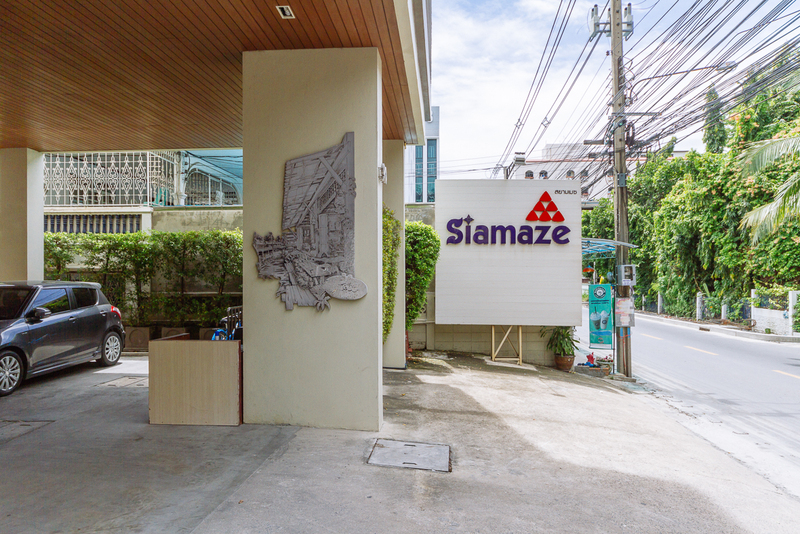 At this street corner, turn right (next to McDonald’s), walk 300 meters into the Soi (sub-street) and Siamaze is located on your left, next to a canal bridge. From either airport, you can find a public meter taxi easily. Just follow the sign. Public taxi is usually colorful, half green and half yellow for example. Tell the driver to go to Soi Ratchadapisek 17. 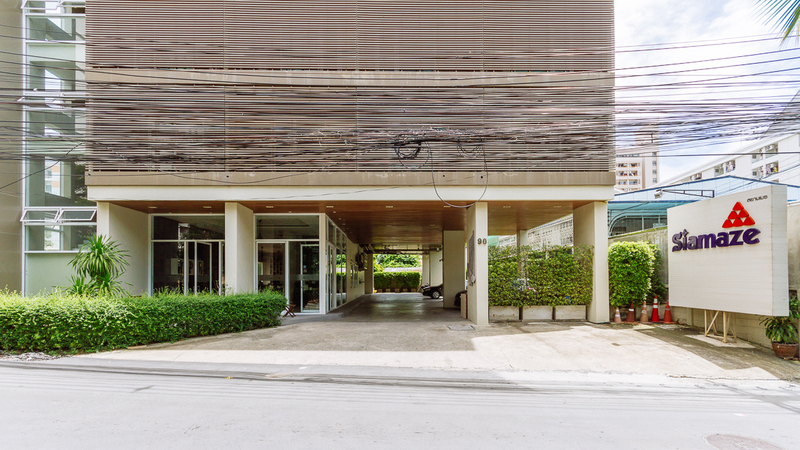 (Address in Thai “โรงแรมสยามเมซ” ซอยรัชดาภิเษก 17) Highly recommend to download or print the map to show the driver. 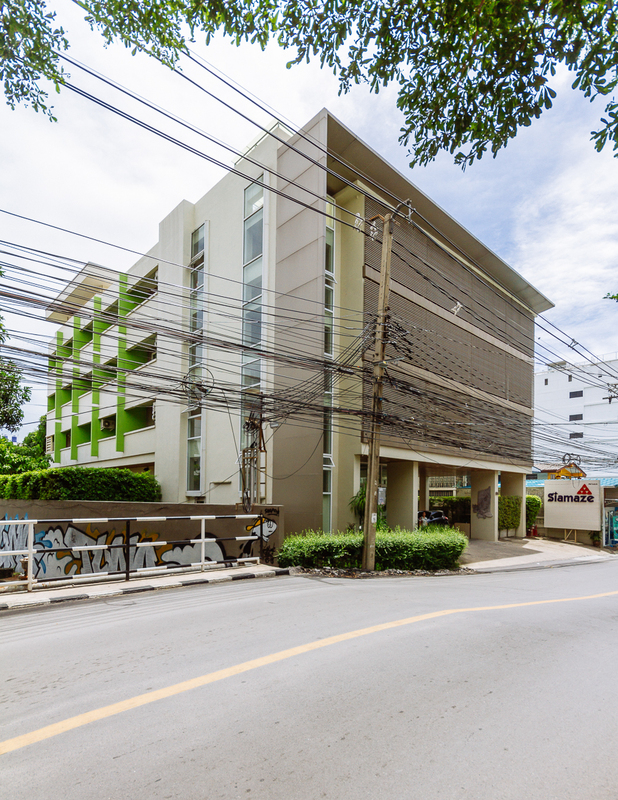 Our hostel is located on Soi Ratchadapisek 17, 300 meters on the Soi (sub-street) off the main road, next to a canal bridge. 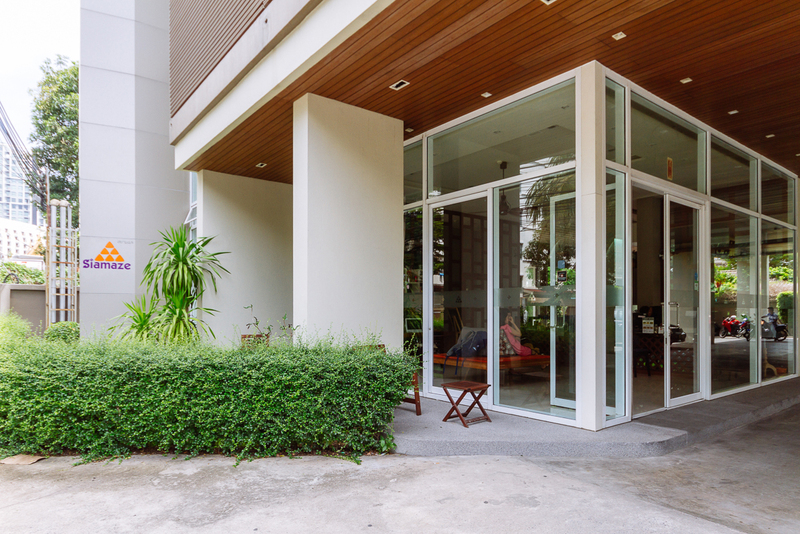 Total cost should be approximately 300-350 Baht during NON rush hours plus a flat fee of 50 Baht for airport surcharge. The fare should be metered using the distance traveled. In case of using the Express Way, passenger is required to pay for the toll fee at the toll gate. 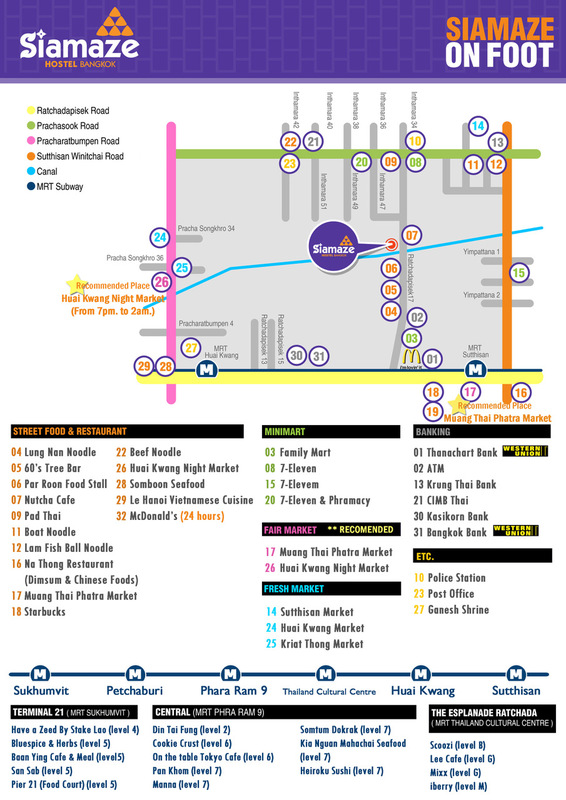 From Donmueang Airport, you can take the airport shuttle bus line A1 (bus fare 30 THB) at G floor to BTS Mochit Station.